Out with the old, in with the new. Our evaluation stations have been long do for an upgrade. 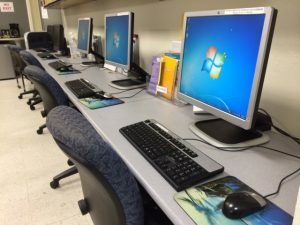 The computers had previously been running Windows XP with old CRT monitors and clunky keyboards. The operating systems could no longer be updated because the hardware wouldn’t support it. Now we have state of the art computers and flat panel monitors that will allow are students to move through these online training modules at a faster more efficient pace. E-Learning courseware developers like Pearson and Skillsoft have developed learning modules for some of the biggest corporations on the planet, however the technologies that they used were far more advanced than our Windows XP systems were capable of processing. So, we recycled the outdated equipment and brought it some new Macintosh computers that have now anchored out learning center and made us one of the premier learning centers in the market. When we began upgrading the facility we knew we were going to be stuck with outdated equipment that nobody would want. We checked with the local second hand shops and they concluded that they would not be able to resell the equipment because of how outdated it all was. 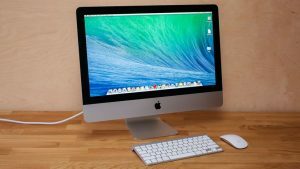 At that point we did’t know what to think and begun to search online for proper disposal options that would allow us to part ways with the old equipment while staying green with our e-waste. We ended up finding a company through Facebook called CDR Global and they sent out a representative to take inventory and give us an estimate. The following week they dropped off a container and group of recyclers came in and started breaking down all the old computers. They shredded hard drives on site, took apart the computers and separated the metals from the plastics. They ordered everything into bins and hauled it all off to recycle. After all the electronics were shipped off to be recycled, it was time to bring in the new equipment. The moment of truth was here, our computer labs were emptied out and it was time to bring in the new computers. We made the decision to purchase iMac computers to consolidate space. The iMac computers were all in one computers that didn’t have separate computer monitors and towers, the actual motherboard and computing took place within the flat panel monitor. This consolidation saved so much space we were actually able to add two more work station and therefore added two more computers giving our students more opportunity to learn in computer lab. The Mac operating system was compatible with the Pearson and Skillsoft training modules and the transition happened flawlessly. If you have a chance and are in the area, swing by and check out one of our new workstations for the ultimate e-learning experience.